Types of Credit and Debit Cards Based on Technology is quite important to understand for securing your money and solving issues like transaction declined issues. Unfortunately still date there is no single technology based card available. So you need to know the basics – which actually troubleshoot yourself faster and prevent extra paying of interest. Types of Credit and Debit Cards based on technology behind might not even support the ATM or Automated Teller Machine all over the World. Debit card is always linked with an account while Credit card may or may not be linked with an account – that translates to the fact – Debit card is basically unsafe as YOUR money is directly getting out in case of fraud. If you practically pay within the issuer’s stipulated time, there is no interest usually incurred. During online or physical shopping payment terminal or point-of-sale (POS) system verifies the transaction whether the transaction will take place or not. There are third parties in the middle who maintains the relationship with Bank. They are the organizations who defines the standards for security. You can actually classify the types of Credit and Debit Cards based on technology by the outer look. MasterCard has the Chip Authentication Program (CAP) for secure e-commerce, Visa has the Dynamic Password Authentication (DPA) scheme and like-wise named cards bears a Chip looking like a SIM card’s contact points. These are called EMV cards as an abbreviation from Europay, MasterCard and Visa, this is try to set a global standard for inter-operation of integrated circuit cards. Debit Cards usually lacks this chip. They have the magnetic strip only. These cards collectively known as Smart cards. They can be Contactless or Contact smart cards. Unfortunately except the dimension; that is 3?? Ã— 2?? in in width and breadth, logos, the punched name, number and dates; a wild guess of the card only can be made to divide in to cards with EMV and cards with no EMV. So basically, types of Credit and Debit Cards based on technology can roughly be estimated from the presence of the chip set. But, one country’s major outlets might not be backward or forward compatible. In these cases, transactions are declined. The technology in case of online payment is determined from the number (which is not possible to guess by normal users) by algorithm. Whole process is related to server and networking technology. There are several handshaking happens to validate a transaction. For example, usually the ATMs has no backspace on their keyboard. If you type one digit wrong and want to retype, in most cases that transaction is canceled. Note that, Card’s number is a part of the security chain. This Article Has Been Shared 1506 Times! Desktop Virtualization with VMware focuses on the details of the technical functioning, economic benefits for businesses and advantages of the software. Data center are basically physically more prone to attacks than the problem of softwares. These physical factors apparently an average user will never think of. Cloud Computing Guide on PaaS will guide you the proper usage of PaaS, which is a type of cloud computing service model which is delivered as a service. Virtualization in the Data Center brings more efficiency. But does this mean a compromise to IT security? How one can mitigate data center security risks? 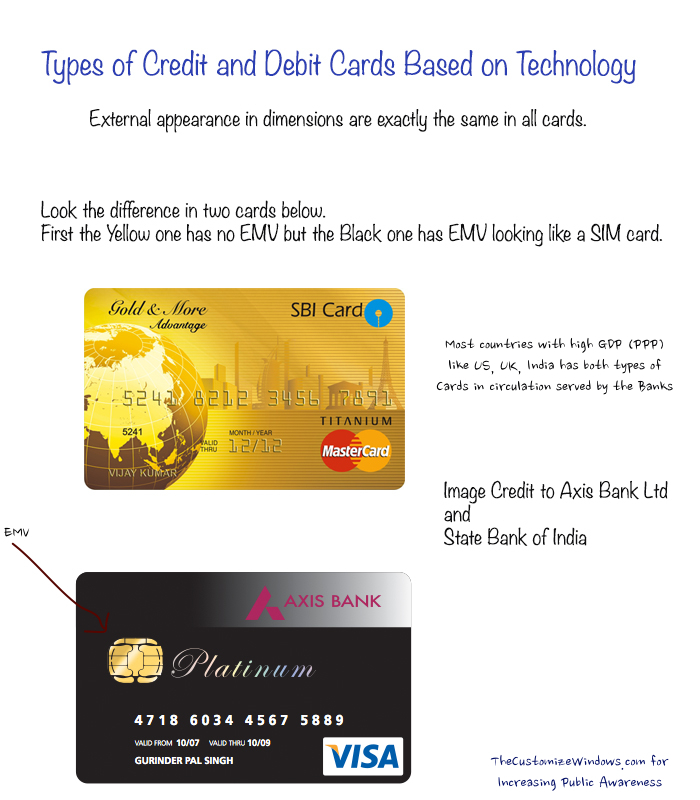 Cite this article as: Abhishek Ghosh, "Types of Credit and Debit Cards Based on Technology," in The Customize Windows, April 13, 2013, April 25, 2019, https://thecustomizewindows.com/2013/04/types-of-credit-and-debit-cards-based-on-technology/.